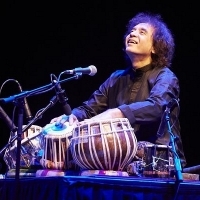 Multi-award-winning Indian classical tabla player, AKA Ustad Zakir Hussain. Zakir is the son of the late renowned tabla player Ustad Alla Rakha and has frequently collaborated with jazz musicians such as Jan Garbarek and John McLaughlin. Recommmended albums include "Shakti" (with McLaughlin), "Making Music" (with Jan Garbarek) and "Planet Drum" (with Mickey Hart).